Facebook is analyzing all new feature allowing to sell goods by posting in a group, according to the report published in The Next Web. 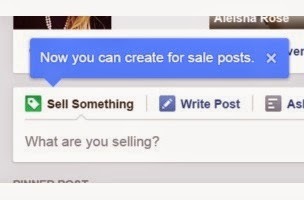 In the report it was mentioned that some users found “sell something” button next to the “write post” button. On clicking the button it requests the user to enter title, product description, product image, price, location and the pickup\delivery option. Once this post is posted by user the interested people can comment, inquire, and purchase the product. After this report was published an official statement from Facebook came, saying “this test was limited to select groups which have active selling communities today”. Facebook also said it is not in charge for anything sold in a group. A notice regarding the sell something button states that “Any transaction made through a Facebook group is between seller and buyer. Keep in mind Facebook doesn’t own or possess any items a seller lists, so if you have any questions about buying in a Facebook group, try contacting the seller”. A leak related to iOS messenger also hinted that Facebook is trying a way to connect a credit card with Facebook profile. This isn’t the first time the Facebook have tried something like this, sometime back Facebook introduced a feature called “gifts” by which user can send actual gifts to a person who is residing in U.S., but it didn’t performed well and was soon shut down. The new selling feature will surely help the groups with communities who sell goods already by contacting users on Facebook, but what will Facebook do if people get scammed by using this feature. Currently this feature is in beta version but if it plans to roll out this feature soon, they need to get approval in most of the countries.